Cassava has many names across many continents. The English word is cassava, but it is called mandioca in South American. In Africa where French is spoken it is called manioc. In Spanish-speaking countries it is called yuca. Here in Asia we call it tapioca. The origin of tapioca is in the tropical areas of American continents, especially in South America. The countries such as Guatemala, Mexico, Peru, and Honduras planted cassava three to five thousand years before the plant was distributed across the Americas and elsewhere. In the 15th century, Portuguese traders brought cassava to the African continent. Cassava reached Asia around the 17th century, when Spanish brought it from Mexico to Philippines. In the 18th century, Dutch brought cassava into Indonesia. There is no clear evidence of when cassava was introduced into Thailand. It is assumed that it was brought from Malaysia around 1786. Originally Thais called it “man mai” or “man samrong”. In the Northeast it was called “man ton tia”. In the South it was called “man thet”. Presently it is called “man samphalang”, which is similar to the Javanese word for cassava, “sampeu”. No matter how many names this plant may have, Thailand is currently the largest producer and exporter of tapioca products in the world. It generates a great amount of revenue for the country. Cassava was first commercially planted in the South of Thailand, where they were planted in between the rows of natural rubber trees. Much of them were planted in the province of Songkhla, so many processing factories were established there to produce tapioca starch and tapioca pearl for export to Singapore and Malaysia. However, the production gradually declined as the rubber trees fully grew. Planting area was then shifted to the Eastern provinces such as Chonburi and Rayong. As market demand increased, the production extended to other provinces, especially in the Northeast. There are two types of cassava in Thailand and elsewhere in the world. The second one is bitter cassava with relatively high hydro cyanic acid content. This is not suitable for direct consumption by human or animal. It is normally processed into products such as tapioca chips, pellets, starch and alcohol. 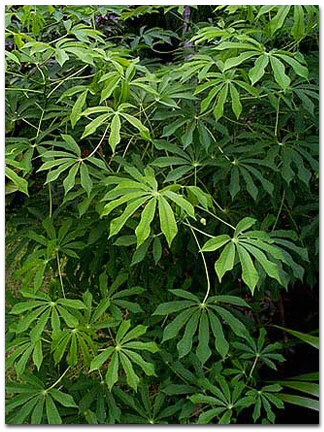 Most cassava planted in Thailand are of this type. Cassava is currently planted over eight million rais of land or 1.3 million hectares in 48 provinces with total output over 30 million tons of fresh roots each year. Approximately eighty percent of them are processed into tapioca starch.